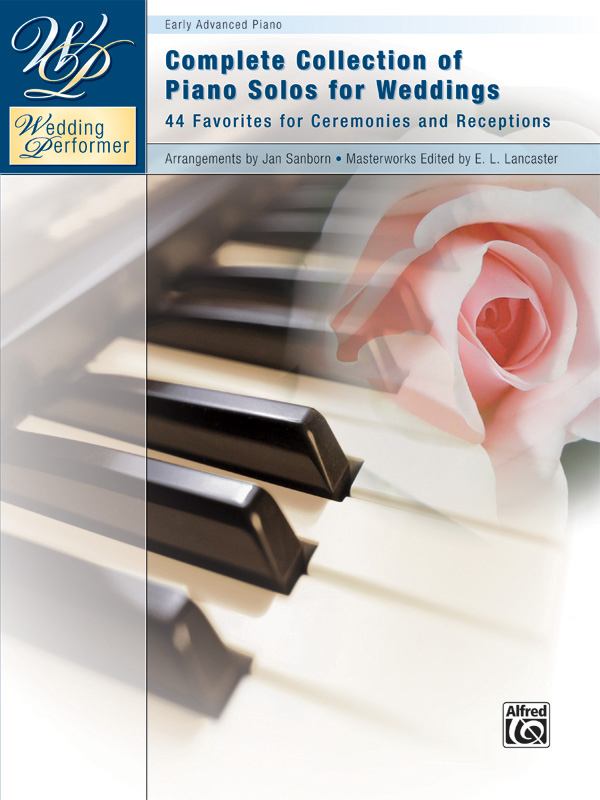 * For the wedding pianist, this comprehensive collection contains 44 piano solos of the most frequently requested wedding preludes, processionals, interludes, and recessionals; plus, other beautiful music to play at receptions. * Lush arrangements of popular and standard romantic ballads complement a treasury of piano masterworks, and selected Christian wedding favorites. * The wedding party and their guests will enjoy the beauty of these timeless favorites. * Additionally, a 4-page guide will aid brides, grooms and pianists in choosing music for the ceremony. * Titles: Adagio Cantabile (2nd Movement from Beethoven's "Grande Sonate Pathétique"), Andante, from Elvira Madigan (Mozart), Be Thou My Vision (Traditional), Beauty and the Beast, from Walt Disney's Beauty and the Beast, Bist Du Bei Mir (Be Thou With Me) (Bach), Bridal Chorus, from Lohengrin (Wagner), Canon in D (Pachelbel), Clair De Lune, from Suite Bergamasque (Debussy), Dream a Little Dream of Me (Standard), Emily (Johnny Mandel), First Gymnopédie (Satie), The Flower Duet, from Lakmé (Delibes), Household of Faith (Steve Green), How Beautiful (Twila Paris), I Will Be Here (Steven Curtis Chapman), I'm in the Mood for Love (Standard), Jesu, Joy of Man's Desiring (Bach), Laura (Standard), La Réjouissance, from Music for the Royal Fireworks (Handel), Love Theme from Romeo and Juliet (Tchaikovsky), Love Theme from Scheherezade (Mendelssohn), Love Will Be Our Home (Steven Curtis Chapman), More Than You Know (Standard), Nocturne in E-Flat Major (Chopin), Notturno (Grieg), O Mio Babbino Caro (Puccini), O Perfect Love (Traditional), Ode to Joy (Beethoven), Panis Angelicus (Franck), Plaisir D'Amour (Martini), Polka Dots and Moonbeams (Standard), The Prayer (Celine Dion and Andrea Bocelli), Prelude in C Major, from The Well-Tempered Clavier, Book 1 (Bach),Prelude in D-Flat Major (Chopin), Prelude, from Te Deum (Charpentier), The Prince of Denmark's March (Trumpet Voluntary) (Clarke), Rondeau (Mouret), Take My Life (Holiness), Träumerei, from Scenes from Childhood (Schumann), Trumpet Tune in C (Purcell), Wedding March, from A Midsummer Night's Dream (Mendelssohn), When Love Is Found, A Whole New World, from Walt Disney's Aladdin, You Raise Me Up (Josh Groban).